Warframe. The name alone may sound a little cliche but don't judge a book by its cover or name in this case. I did that and I would consider it one of my biggest underestimations of what lied beneath the surface. Although its release was in March 2013, most people would haven't noticed due to the large amount of triple-A action games were released in February and March. Such as Mass Effect 3, Dead Space 3, Far Cry 3... (so many 3s...) Bioshock Infinite, Tomb Raider (2013). So yes, completely eclipsed and buried under the radar for most people. While those games may have had their time in the spotlight, they are games which usually get put aside after the campaign is completed. Warframe however, is a different beast altogether. It's almost like an MMO (Massively Multi-Player Online game), but it doesn't have the grand scale where you play with hordes of other players in the same zone. It's a pure co-op game (4-player group in most cases) and has evolved with time with frequent updates, both major and minor to extend its longevity and to cater to a growing fan base. Unlike a traditional MMO, there isn't a 'holy-trinity' class group makeup required for doing anything. But we'll get into that later. The only time you may see a large group of players are in the Relays. Relays are like friendly spaceports for players to gather to commune, trade and visit their supported Syndicate (NPC faction). Some may say that MMOs usually die off after a year or two and they aren't wrong. One example is Warhammer Online which I played for a year until it started consolidating servers due to lack of players and its eventual demise. So, for those that are wondering whether the game is still alive and kicking... here's a screenshot of the last 10+ months. Warframe's average fan and player base is indeed growing on a monthly basis. With consistent growth in its player base, it's definitely not going the way of the Dodo just yet! Now is a better time ever to play it with many new players joining the ranks. As a note, I was skeptical at first with reading all the mediocre reviews (from 2013) but it was a first for me to see the loyal fanbase post much more recent comments defending that the game has been vastly improved from 2013 and to go try it out. Furthermore, it's Free-2-Play! So essentially upfront there was nothing to lose. Although the tagline, "Ninjas Play Free" may not exactly evoke the most exciting response, you could say that it is about Ninjas in Space. Warframe has its own lore and it's intresting enough to form the construct of the world you play in. Players are in control of a Tenno, an human-like race, and you are in command of a Warframe. Warframes are similar to RPG-classes. They are like an exo-skeleton combat suit each equipped with their own set of unique abilities. Currently there are over 20 different and unique Warframes. Eventually you'll own more than your first one so that you'll use a different Warframe depending on the mission and your group's composition. It's a 3rd-person shooter, like Dead Space, Tomb Raider. It's mainly an online co-op game for up to 4 players like Borderlands 2 and Diablo 3. It's got a crafting system where you kill bosses for parts or blueprints to make parts, for constructing new equipment/Warframes like Monster Hunter. And it's Free-To-Play. Which also means, alot of grinding like an MMO. The in-game currency bought with real money is called Platinum. Platinum is essential to the game. It has a game economy to obtain said gear/warframe parts via trading between players. Players can trade with Platinum or other blueprints/parts/keys, etc. Although there's no 'holy trinity' of classeshere, Warframes can be classified into Damage, Support and Tank. Pick one that suits your playstyle! It's not required to have a healer (e.g. Trinity) in a team all the time. You can complete missions successfully in most cases with a competent group of players. It's fast paced. It's got parkour like Titanfall or Assassin's Creed: scaling walls, wall running, double jumping, rolling, bullet jumping (the fastest way to travel vertically/horizontally) and floor sliding (and shooting while sliding). You'll need to master all of these to transverse the procedural generated map sections. Most maps are hardly ever the same but their individual sections are constant. Veteran players who seem to fly through the map at incredible speeds know map section layouts by heart and in time so will you. Most new players may struggle with reading the map and knowing where to go even if there's an icon roughly showing you the way. The multi-level design with hidden passages, nooks and crannies can confuse the uninitiated. It can be frustrating if you're impatient but learning the map sections is part of learning the game. Judging by the amount of free-time you have, you either love it or hate it. If you enjoy games like Diablo 3: Reaper of Souls and Monster Hunter, there's a high chance you'll enjoy Warframe as well. Diablo 3 focuses on armor and weapon drops. Monster Hunter focuses on farming monsters for parts of armor and weapons to be crafted together. Warframe is almost like that, where common and rare crafting materials are dropped by killing mobs. Blueprints of gear or the parts themselves are rewarded from killing bosses and/or completing missions. A little look at my inventory of some Prime Parts. Currently, Prime Parts (with some non-Prime exceptions) of gear can be traded between players. You'll have to source non-Prime equipment on your own solo or with a group. Exterminate: Kill X number of enemies. Endless mode missions have enemies that gradually get tougher and tougher and in general the longer you hold out the better the rewards. Some missions have a loot table that makes it only worth it to stay for only a specific duration: e.g. 4 sets of 5 waves (20 waves) in Defense or 20 mins (4 x 5 min) in Survival. First you'll have to select a planet (more will unlock as you defeat the boss of each planet). The full range of planets and locations await you once you've unlocked them all. Then you'll have to select a mission from any of the segments of the rings around the planet. Each planet's enemies are of a level range and the inner ring of missions have the easiest enemies while the outer ring has the harder enemies for that planet. and in this picture below the Mission is an Alert and its availability will expire in a set amount of time. Alerts always have a reward for completing it. This will give you an idea of what to equip in your Arsenal. Bring the right tool for the job! Some missions are inaccessible because you need to complete an adjacent mission next to it to unlock it. In this picture below, the right most mission is locked (greyed out). Other missions have a white border indicating that I've unlocked it but have yet to complete it for the first time. All regular missions are repeatable and come with no lockout period. So you can farm that Assassination mission to kill the boss of the planet for parts of a Warframe you'd like from it. Some sectors are coloured differently due to time limited missions being available. They are usually clearly marked with icons to show if it's an alert, syndicate mission or an invasion. As you progress through the game you may get Tower Keys as a drop. Getting your first Tower Key will unlock the Void as a destination in the Navigation interface. 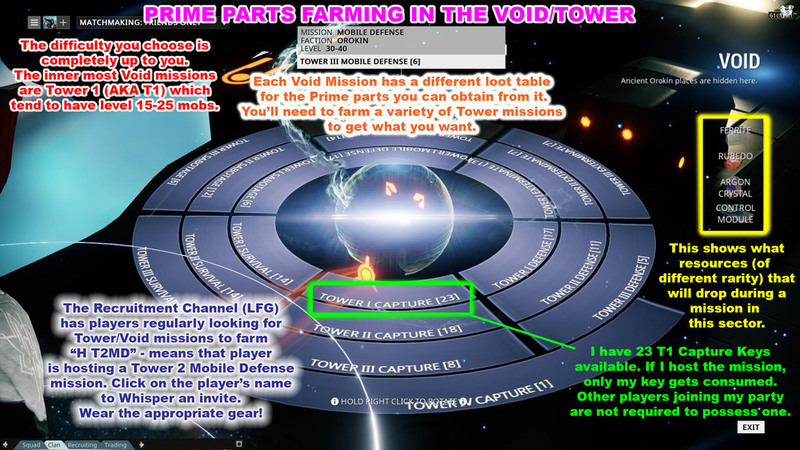 Void missions are where you farm for Prime parts! Prime gear (Warframe and Equipment) have better stats and are definitely a visual improvement from the vanilla version. More on that in the Gear section. Tower Keys are a consumable item. The player that selects the mission from the Navigation interface is considered the "Host". Only the Host is required to have the key and only his/her key will be consumed when starting the mission. At the end of every (hopefully successful) mission, the game will list out your rewards on the bottom left and mid of the screen. Mods are in the bottom mid where as Credits, Resources and Blueprints are listed in the bottom left. Check here to see you've gotten what you've been looking for! Once you've gotten the required parts it's time to see whether you can afford to (Credits and Resource wise) built them. This is the Foundry interface that you'll eventually unlock as well by completing the tutorial. You can see the vast collection of Blueprints you've collected as you progress and play the game. Since I have all 3 parts (Chassis, Helmet and Systems) of the Oberon Warframe, I can being constructing them. When you've collected all 3, you can head over to the Foundry to construct them. Each pieces takes different amount of resources and takes 12 hours to complete (each have their separate timers). When they're complete, you'll then need the Blueprint to put them all together for the final assembly which will take 72 hours! That's 3.5 days for a complete Warframe construction! Of course you can rush it with Platinum if you can't wait. Personally I have plenty of items to level up so I always wait out till it's completed. The maxed out Orthos Prime can no longer gain any XP whereas the others will gain more or less XP depending on their usage during the mission. 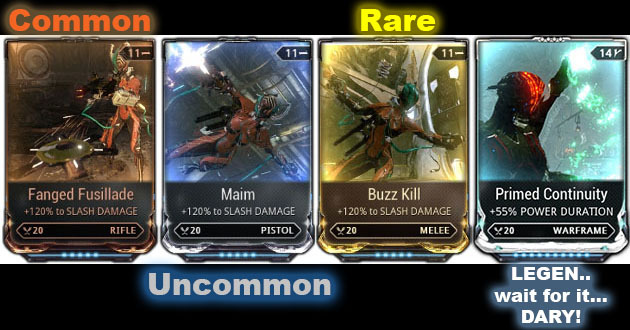 Ranking up items is directly related to the mod capacity of the Warframe or Weapon. An unranked item will have 0 capacity where as a maxed out Rank 30 item will have 30 capacity. Players who love that particular item can double the capacity through the installation of a special item called an Orokin Catalyst for Weapons and Orokin Reactor for Warframes. The Warframe community fondly calls these Potatoes due to the shape displayed in game. Potatoes can be bought with Platinum (20p) directly from the Action tab of the Arsenal. The main reason you Potato an item is that veteran player's mods are usually max rank and that requires alot of capacity for mods on an item. 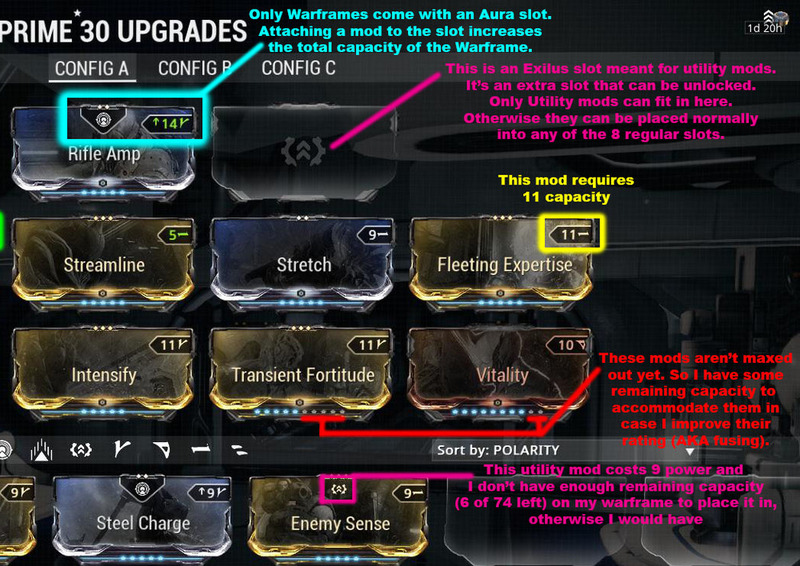 In combination with Potato-ing, you can also Forma the mods slots on the item to make it a specific polarity. A slot with a polarity that matches a mod's polarity will halve the required capacity to install the mod. We'll talk about that in depth in the next section. As a player, you'll want to max rank as many Warframes and equipment as possible as this ties in to the game's Mastery System. As the name suggests, Mastery is how the game measures the total combination of XP gained from ranking up equipment. It's a basic measure of how many Warframes and items you've played with in the game. A higher mastery rank directly determines how many trades you can perform a day with other players. Any separate instance of selling or buying constitutes to a single transaction, so a Mastery rank 3 can only sell/buy a total of 3 times a day. You'll also need to be Mastery Rank 2 to start trading. In addition, a higher mastery rank will allow you to access previously Mastery locked items or blueprints. For example, a Blueprint that requires MR (Mastery Rank) 5 will unlock once you obtain it. You can only level up your Mastery once every 24 hours. Passing or failing the test results in the same 24 hour wait between the just attempted and the next available test. So try your best not to fail! Any gained Mastery XP will accumulate and roll over even if you're ready to Rank up but the test is not available yet so there's no need to worry about any Mastery progress not carrying over. Warframe has a Mod system. They look like cards and come in different varieties and rarities: Common, Uncommon, Rare and Legendary. Unfortunately, the game doesn't fully explain the mod system in its tutorial, which is a disappointment, as the Mod system is essential to progression in the game! In fact, fusing mods (improving them) is directly linked to how powerful you are as a player/character. Since it's so important, let's have a look at them. Here's how it looks like in your Modding screen. The cards are visually reduced in size so you can scroll through them quickly. When you highlight over one, it will expand showing you the full art and details. When you receive mods as a drop or reward in game, they always start Unranked. In order to improve it, you'll need to perform 'Fusion' on it. The option to Fusion is highlighted in the below photo. Replace those DAMAGED Mods you got in the beginning the game ASAP. Below picture shows a Damaged Serration on the right - Tip: Don't to Fuse/Improve them as the normal version is vastly superior. Note that when you start the game you'll be getting damaged mods during the first quest storyline. This is meant to show you the variety of mods that are available in game. As you progress past that, you'll be getting the regular versions so it's best to replace those damaged mods ASAP. In the photo above, a Rank 6 Serration (10 capacity drain) gives +105% Damage boost to your rifle. Whereas a fully ranked Serration (Rank 10) gives +165% Damage boost but has a larger drain of 14. When you combine any non-matching polarity/name card to a host card you'll get 25% of Fusion XP. When you combine a card with the same polarity as the host card, you'll get 50% of Fusion XP gain. Fusion Cores, which are like Wild Cards, are most common way to improve the rank of a Mod. Fusion Cores come in all three rarities: Bronze, Silver and Gold. Gold Cores (AKA Rating 5/R5) are the most efficient way to rank up mods in Warframe. The number of mods used in Fusion will determine the amount of credits the Fusion will cost. Since R5 are the most efficient, the total number of mods required will be less than using other mods in the fusion process. Gold Fusion Cores (AKA 'R5'/Rating 5) are the most efficient way to rank up mods. Yummy. After you rank up your mods and eventually max them out, you'll essentially have a more powerful Warframe/item at your disposal. But as the rank of the mod increases, so will the requirement of each mod's drain on your item's capacity. And this is how it looks like when placed in your gear. In this example, these are mods installed on my Warframe. Capacity is the single most important feature of an item that will determine how many and how powerful of a mod you can plug into your Warframe or equipment. More is always better. Potato it for the first time to notice instant improvement to its capacity! Looks like I'm going to run out of space if I intend to max out all my Mods. Just like Potatoes, Formas also cost 20p from the market. Forma-ing an item not only makes it more efficient in accommodating mods but it also resets the item to Rank 0! Let's rewind a bit, an item will need to be max rank (30) in the first place before you're able to perform the first Forma. Once you do that the weapon will have a little Asterisk (*) on top of it's name to show you the number of times you've Forma'd it. Forma can be obtained from the in-game market at 20 Plat, or the Blueprint of Forma as a reward from Alert or Tower Missions. My Tonkor (a Grenade Launcher) that I love alot has been Forma'd 4 times already! As shown above, my Potato'd Rank 14 Tonkor has a capacity of 28. Without slots having polarities, I can only accomodate these two mods of 10 and 15 drain respectively. As you can see that my top row has 3 'V' polarities, therefore I can place them in these slots to make way for more mods! Here's another example of a heavily Forma'd weapon, my Sonicor that has been Forma'd 6 times so I've had to max rank this weapon a total of 7 times! But in my opinion, it's totally worth it for this prized secondary of mine. As a note: Re-leveling a Forma'd item does not contribute towards Mastery gain, only the first time you max rank an item will. One of my favourite Secondaries in the game, The Sonicor with 6 Formas! So what's all the purpose of existence of all these Mods? They're meant to serve as damage, utility boosters for gear you acquire in game. There are weapons: Primary, Secondary and Melee. In the pictures below, the Paris (a bow) is a Primary Weapon given as a choice (the MK-1 version AKA starter version) is given during the mandatory tutorial. The Paris is one of the choices of a Primary weapon you get when you start the game. The Bo is also a choice during the tutorial (again MK-1 variant). Later you can purchase the blueprints for the regular (non-MK-1) versions of these weapons that feature improved stats. The Bo is another starter choice when you begin the game. It's a Melee weapon that makes a satisfying "TWACK!" sound when you bash an enemy. Most importantly, you'll have a choice of 3 Warframes as you start the game: Excalibur, Mag and Volt. Two of which are shown below. These screens will be presented to you as you start the game for the first time. A balanced Melee Warframe and with recent buffs, Excalibur scales well into late game. Eventually as you start progressing through the game and start doing Tower missions you'll have access to Prime gear drops. These are the bling-bling items of the game. The Boltor Prime. One of the best Primaries in the game that features Puncture damage and Projectile shots. Time to lead those targets! The Scindo Prime. The hardest hitting Melee weapon in the game. J.J. Abrams would be proud of the extensive use of lens flare. Ability wise, there's no difference between the Prime and non-Prime versions of a Warframe. Prime version feature better stats and have extra polarities in comparison. Nyx Prime is master of confusing the enemy and mind control. Loki Prime, one of the stealth based Warframes featured in the game. All these Weapons and Warframes are viewable in the in-game codex. If you like what you see, time to get started on farming those Void missions! Rinse Repeat the grind with friends to make it more enjoyable. If you can't, you'll have to resort to public games. After having played for about 500+ hours I can honestly say I do love Warframe and I still have so much to do in the game! The game is bursting with regular content updates and depth that I haven't experienced for a while and with an active player base, the game is rocking on all fronts. With hourly Alert Missions and having to find new weapons to rank up, or ranking up Forma'd ones, there's always something you can do in game. Trading in the game can be addictive as well as you watch the Trade channel closely for the best deals on sought after equipment. Warframe does many things well and is still being constantly tweaked for improvements. Besides having regular community events with special loot, they have frequent 'Prime Time' Twitch channel Live Streams with Platinum giveaways as well. The developers are hard at work creating new content and keeping the player base interested and growing. I'm looking forward to playing more Warframe! So what are you waiting for? Join us now on our Discord channel #shooters to form a group!